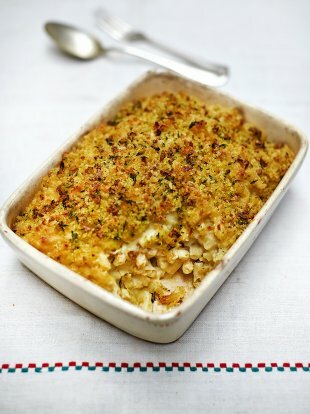 Macaroni and cheese is an American favourite, usually available in almost every diner. Malaysia might not have staple diners, but mac & cheese is definitely known here. Being vegan is usually all healthy and vegetables hoorah hooray, but it does not mean you’re not able to have cheat days and indulge in a lavish meal especially homemade ones. This recipe is formulated by the famous Jamie Oliver, but we tweaked it a little to make it easier to make. It is optional to add vegan cheese (found in specialty stores) and if you’re not vegan but interested in trying the recipe, adding your favourite cheese is still feasible. Cook macaroni according to packet instructions in salted boiling water. Meanwhile, peel and halve the onion, then place in a small pan over a medium heat with the milk. Slowly bring to the boil, then remove from the heat. Pick out and discard the onion, then set aside. Melt the margarine in another pan over a medium heat, then add the flour, stirring continuously until it forms a paste – this is the roux. Gradually add the warm milk a little at a time, whisking continuously until smooth. Bring to the boil, then simmer for around 10 minutes, or until thickened. Stir in the mustard and nutritional yeast flakes, grate and stir in the vegan cheese (if using), then season to taste with salt and pepper. Drain and add the macaroni to the sauce, then stir to coat. Transfer the mixture to an ovenproof baking dish the sprinkle chopped thyme and panko. Place the dish in the hot oven for 20 to 25 minutes, or until golden and bubbling. Leave to stand for around 5 minutes, then serve with seasonal greens. Head over to Jamie Oliver’s website to view the original recipe and the nutritional value of this dish.